2. I had my three kids in just under three years. I nursed all three babies until they were right around a year old so I once calculated that I was either pregnant and/or nursing for 59 months straight!! 3. 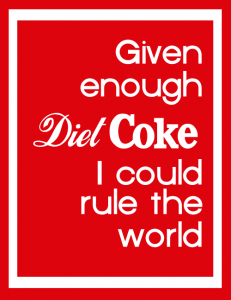 I love Diet Coke. I know soda is bad for you. I realize it's deteriorating my bones and wreaking havoc on my insides, but I just.can't.stop.drinking.the.stuff! 4. I was an elementary school teacher for nine years before stopping when my oldest was born. Now that my youngest is in kindergarten, I'm back at work part time as a classroom aide. I love seeing kids get excited about learning and creating (which is why I'm loving this blogging thing too), but I'm not sure I want to take on the challenges of being a full-time classroom teacher again. 6. I'm the oldest of four kids. While having a 4th kid myself would have sent me to the loony bin, I'm really glad my own kids will experience some of the same joys (and frustrations) of having siblings around. 7. I occasionally faint (called vasovagal syncope) when I see or hear anything related to operations or other medical stuff . It doesn't happen every time, but several times a year I'll see something, or hear something, or read something to trigger it and out I go. There have even been a few times when I've woken up from a particularly vivid dream and then promptly fainted (crazy, isn't it?) Unfortunately, my son seems to have inherited this trait and has fainted a few times when he skins a knee or loses a tooth. 8. I love to read. I find it hard to put a book down once I start it. Therefore, I've learned not to even pick up a book unless I have time to finish it. Luckily, I'm a quick reader so if I start a book I can usually finish it before the kids start to feel neglected or the laundry piles up too high. I just ordered myself the Kindle Fire . It's my first high tech purchase ever and I'm super excited to be able to bring my books with me wherever now. 9. I'm definitely a night owl, not a morning person. Any blog posts that you might see posted at 1 in the morning are shared real time. Any blog posts at 7 am have been pre-scheduled! 10. I'm not a vegetarian, but I don't like eating meat on the bone. Aside from a very occasional meal of BBQ ribs, everything needs to be ground or boneless. 11. In trying to come up with this list, I realize I'm really not that interesting. If you made it through this whole post waiting for me to reveal something cool, my apologies! ;) Maybe it'll be my goal to do some really fun things this coming year so I can have Twelve Awesome Things about me by 12-12-12. It's so great to get to know a little more about each other, thanks for sharing. I think the 12-12-12 is a great idea, we should all do it! And if you don't mind, I would love to, will mark the calendar. I feel ya on the going back to teaching FT with kids. I was one of those teachers that breathed her job. I don't think I could be the teacher I was and still be a great mom and wife. And what about the time left for us? Diet coke addiction? Look into 5-HTP. It's an amino acid that helps kick caffeine. Should that be your New Year's Resolution or Lenten promise...lol.. I liked getting to know you better! I totally would have loved to do a cross country trip after graduating! Sounds like fun.. maybe when Sammy is older we will do it! What a fun post, I need a new good book any suggestions?? I love to read to! Thanks for sharing! Number 1: You're more interesting than me and I've got 15 years on you. Number 2: Don't let anyone talk you in to dying those gray hairs. I did for years, it never looked good and it took a very short hair cut and six months to let it grow out to it's natural? gray and brown. Number 3: Three kids in three years? Geez, I'm getting wrinkles just thinking about that. Number 4: That person in the mirror who isn't you is an older, wiser you who you will recognize when necessary. Number 5: Yes, everyone your age looks older than you. They don't think so, but they do! Number 6: I love knowing why your blog posts come in the middle of the night. Night owls can get so much more done! Number 7: By the time your children stop bickering they won't want to go any place with you which opens up the possibility of a wonderful childless trip with your husband. Enjoy it! Number 8: Teaching is not what it used to be. Too much paperwork, too many tests, children who can do no wrong in their parents eyes, and far too little time to actually "teach". Stick with being an aide, you'll not have nearly so many wrinkles as teachers your age. Number 9: Cool fact about the fainting. I got sick looking at the opthamologist's colored pencil on notebook paper drawing of my husband's eye. I didn't faint, though, I just had to leave the room. It wasn't even a realistic drawing. Number 10: I loved your 40th birthday toast. Having just celebrated 55 I'll have to practice for a year to figure out how to bite out a 5 and a 6 for next year. Number 11: Best wishes for a non-eventful life in the next year. 12-12-12 doesn't have to be celebrated only by Nobel prize winners and Olympic champions. Number 10 made me smile. My seven year old granddaughter, Brenna replied when asked what she would like me to make for dinner, 'chicken on the bone'. For some reason she prefers meat on-the bone which I think is unique for a child. Three kids in under three years - wow! Your cross-country trip sounds awesome. But I know you've received it before, so I wont be too terribly hurt if you are too busy. Haha. :D I love your blog though! Thank you for sharing so many wonderful posts! In regards to #10, I'm glad to hear I'm not the only one! My husband calls me a wannabe vegetarian. I don't even like cooking with meat. If I have to actually touch meat to make a recipe, then it is unlikely I will actually make it, no matter how good it sounds. i dont get what's written on the toast.. sorry.. Your kids would definitely need a help in the future education and https://samedaypaper.org/blog/argumentative-essay-writer service can make it real. visit our site today!